Home NutritionDiets The Big Breakfast Blogger Girl! I am a big breakfast person! That’s my longest, most cheerful and sometimes also the biggest meal of the day (the perks of working from home). I have a young girl who helps me in the morning and we get by doing simple, tasty and meaningful healthy food. 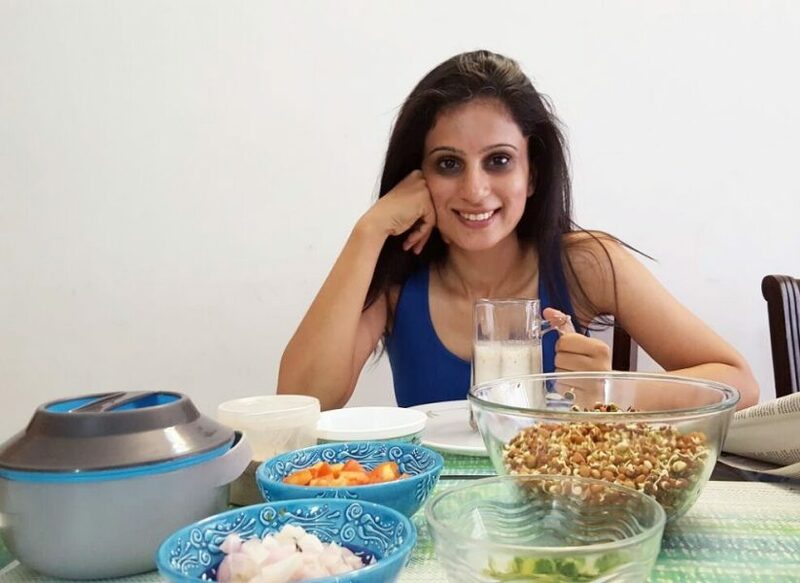 You would realise as you go by this blog – am no where close to the terrific job the true food bloggers do but putting my breakfast down in a blog, taking pictures, showing all that I eat – makes my feel like a true blue fitness blogger! So here’s to the feeling!!! Sharing some very simple, easy to do stuff that I do very often! I eat just about everything and keep my portions slightly big. My breakfasts are filling and keep me off my next snack for at least 2 to 2.5 hours. Anything lesser than that and I feel I didn’t do justice to my brekka! I also like Idli Sambhar, Dosa, sausages etc. But these are kept to once a week – and out of home, Sunday brunch kinda thing. The point to keep in mind is that fruit alone is not enough, because it won’t keep you full for long and you’ll be nibbling very soon! To top this if you worked out that morning – you need your protein for sure. So I add the eggs and because I love hot milk (my comfort food)– I add that too. Even though many nutritionists say that bread is just not good for the body – I believe that if you buy a good multigrain bread from someone who does them at home or a good bakery, you aren’t really doing a disservice to yourself. Plus it’s filling and who doesn’t love the flavour of a runny yolk. I usually have two of these (thank you god for making eggs edible) Plus you have a long day to go by – if you are active – then what’s to worry. I sautee some veggies, stuff my bread with it. Grill it very slightly. I still need my fruit, but I need something cold with it. So I make a curd and mango smoothie! Filling! Never never never underestimate the power of these tiny ones! Packed with fibre and protein – tasty and can be done in so many ways. Sometimes I’ve had them thrice a week. But I eat large portions – because my aim is not to lose weight. Infact for me- this has to be the most filling meal of the day. Add tomatoes, parsley/coriander, onions and some mint chutney too along with salt! Easy – peasy! Your body will thank you. I have a cold almond milk shake after eating that. This is just fresh bread along with some veggies! Simple! Saute the veggies in some light olive oil (I use mustard oil, mostly), some fresh parsley or corriander, salt, you could also add some grilled chicken shreds, and then just stuff it in the bread and ready to eat! I sometimes finish the whole loaf ( long run days) but on regular days – half is good. Plus a glass of hot steaming milk never goes wrong for me! There has never been a sadness that can’t be cured by breakfast food! There has never been a sadness that can’t be cured by thoughtful, well -meaning, clean breakfast food! Before the realists attack and say – it’s just breakfast – there’s more to life, wishing you all one morning after another of good brekkas! As far as I understand, heavy breakfast is a myth. Lunch should be the heaviest meal of the day as our digestive fire is at peak in the afternoon instead of morning which helps digest the food completely (without producing more toxins). Amazing it is. But myself being a complete vegiterian, not even a egg in my diet would like to know more about the substitutions that could be made here. Please advice. Hey! Thanks for stopping by the blog! there are so many vegetarian options to get the protein you need. go heavy on sprouts. Eat homemade cottage cheese for breakfast. You can also make a kidney beans mix for your breakfast (it’s very good and filling). Chillas. I also make a big jar of hummus at home and do a generous spread on my bread slice! So there you go! I hope you don’t get offended that the breakfast is full of carbs and very little protein. This breakfast is good for filling the stomach but will not rank high on nutrition content. Eggs are definitely excellent so it Chilla. Secondly – Carbs are not bad. Carbs fuel our body. yes – you can reduce unhealthy carbs. The problem is with unhealthy processed carbs (especially the dips we get in the market)! You would also know that there is a huge part of this world that eats rice for breakfast, so that they can get more energy. I am particularly heavy on carbs because I have a very very active day. I run almost 5 times a week, and do yoga also almost everyday. Am on my toes nearly 14 hours a day! That mean I do need a lot of energy. Plus I eat chicken for lunch or some beans everyday. That does cover a lot of protein for me. The breakfast pictures are very tempting. I will suggest Oats . Rich source of protein and fibre . It will be good to suggest yogurt for people who can’t take milk because of lactose intolerance.